Elango Cheran, a developer in Silicon Valley, CA, USA, has been quitely developing a powerful macro-based framework of Tamil programming capabilities on top of Clojure. He has also added various tools on this platform, even tools with teeth – i.e. converting encoding from various Tamil encoding standards, and implementing santhi rules etc. I found his blog post on his efforts in programming in Tamil to be highly persuasive, and make a strong case of programming literacy in the vernacular. I concur with some of the views expressed on ability to reach a literate audience in their vernacular without having to be pigeonholed in English language. The socio-cultural need to open up world of programming to vernacular speakers has continued to haunt technology penetration/access. The field of native language programs has few leading lights. We need more players, and time to build developer interest here. 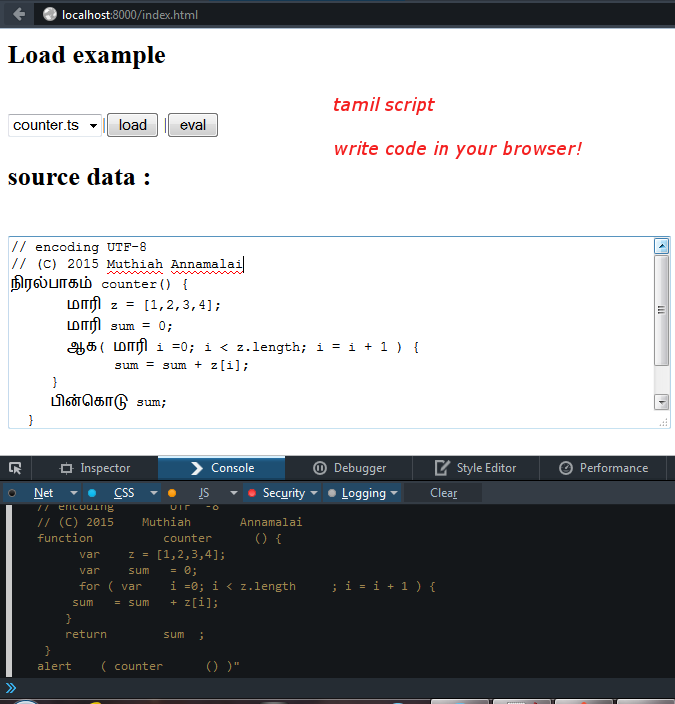 Demo of Tamilscript for use within a web browser. Tamilscript can leverage jQuery, and power of modern web browsers. Comments and suggestions welcome. I will release the code if we reach any sizable level.